After taking this picture, the Scribe got a little fed up with my attitude. I guess I can’t blame her. She works hard to make things look nice, and her goal is not to achieve real winter. She says I can go outside and experience that. I can have all I want of it when we get home. “Show some spirit, Stella!” she said. Then she got an idea. I hate it when Elizabeth gets ideas. I really did take this photo. I stepped on the remote. “Wait!” cried the Scribe, “We need to move that box first…” Too late. I went back outside – not Outside into Winter. Just outside the Christmas Room. It’s too small for both of us. Elizabeth took another picture from two-legger viewpoint. Just so all the other dogs who read this can see what’s up on top of the table. Look, another lesser Black Cawing Flapper! He’s not real, either. Neither is the Snowman. The cards and books and other interesting little Christmassy/wintry things. Oh! And there’s the Christmas Wreath hiding in the corner. Elizabeth says she’d better get that bagged and stored ’til next Christmas. That’s today’s tour. Just one great big tease, if you ask me (today’s supposed to be my day off to play in the snow). A couple of weeks ago, everyone here was celebrating Christmas. There was a lot of build-up to it among two-leggers (there always seems to be) – people decorating and putting up lights all along the big gravel path, people rushing into stores with lists of things to buy…. 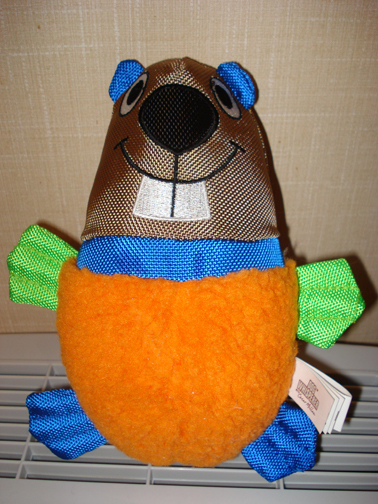 And this year, my blogging friend Rumpydog decided to make it more fun for us dogs, not to mention more accessible! 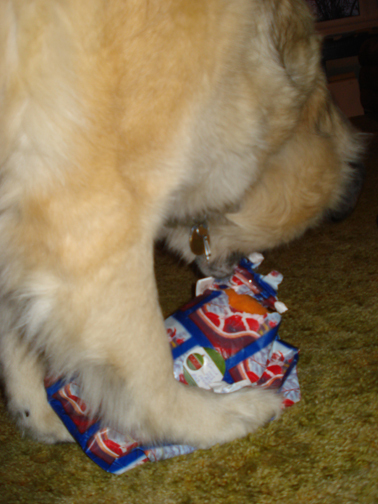 He acted as go-between for dogs everywhere who wanted to contact the dog equivalent of St. Nick, Santa Paws! Well, with all the furor in two-leggerdom, I decided maybe I should explore the idea of Santa Paws and the possibilities in writing to him as my pal Rumpy suggested. And Santa Paws got my letter! Not only that, but dogs everywhere added their voices to support my Christmas wish. You can go into Rumpydog’s blog and read it here if you haven’t seen it yet. Christmas morning. Elizabeth came out and took me for a walk. Nothing new there. She let me off my lead when we got to the big gravel path and I raced for home. Elizabeth. Took. Her. Time. When we got in, everything seemed just as usual. No new scents. No sense of tension or excitement. Elizabeth fixed me up a bowl of food: my usual kibble. But today she made it special by adding some chicken-ball stuff and some special gravy Kay made for me. It was reeeeally good – I pushed my dish all the way over to the food cooling box trying to get every last little morsel licked up. But it still wasn’t what I’d asked Santa Paws for. After the two-leggers had also eaten, Elizabeth brought me my Christmas present. It isn’t that I didn’t appreciate it. I love pig ears and, since the vet told Elizabeth I’m not to have any rawhide or jerky, I haven’t had one. So this really was a special treat. And I treated it accordingly. And it was really good, too. But… it wasn’t what I’d asked Santa Paws for. And a Berryz cookie after my meal! You know the one I mean. She said that even the baby Jesus had to wait for his gifts from the Three Kings of Orient until Epiphany, which, she counted out for me, was the sixth of January, a.k.a. the Twelfth Day of Christmas. It was AL! And there, in the front seat of Al’s big red growly beast, was my dearest dog pal in all the world, Bud! Bud had come to see me for Christmas, all the way from Winnipeg, many, many dog miles away (I know ’cause I’ve been there). It’s a long trip for him ’cause he’s getting old, and sometimes he has trouble just getting into the growly beast for the ride now. Al came to the door carrying a big heavy bag. If he’d had a beard, he would’ve looked just like St. Nick, I think. 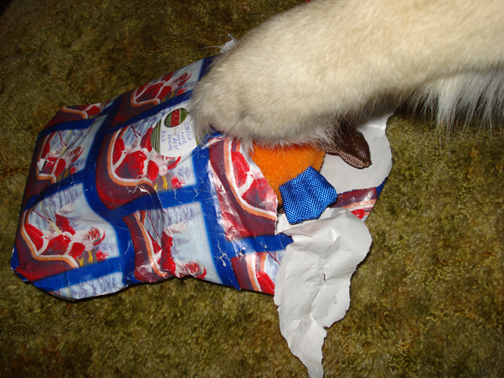 And in that big bag… Bud had brought me a Christmas present, too! More treats as well – I think they came from Joanne. 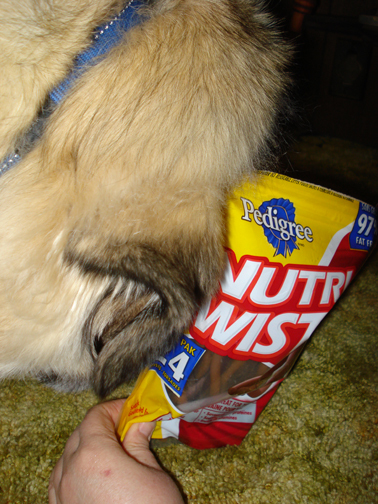 I love my treats, and Joanne always has such yummy ones to share…. I’m trying hard to be tidy about this, but whatever is in there just isn’t coming out! 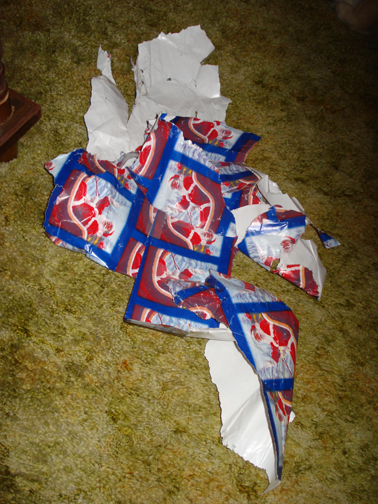 The Aftermath of my exuberance! Can I open this up, too? Please? 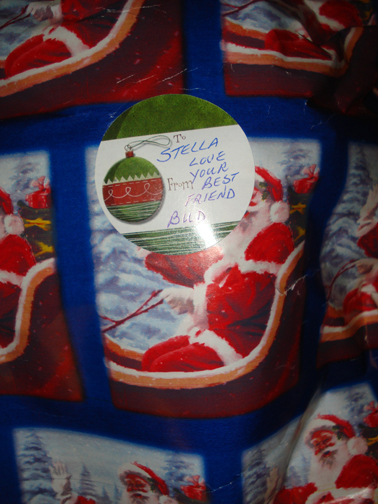 Here’s Bud’s gift: A friend to remember him by. I’m calling him Justin because he arrived just in time to make my Christmas. Thank you, Bud! You’re the BEST! Thank you so much, Santa Paws. I knew in my heart I couldn’t have a full time dog-friend here. You did the next best thing by bringing Bud to visit and letting me know that he was still well and thinking about me, too. Thank you, Rumpy, for helping me get my message to Santa Paws and for instigating the Mutt ‘n Howl Telegraph. Christmas is wonderful! It’s been a while since I’ve done a Tail Thumper. Tell you the truth, I was getting a bit discouraged about them. Lots of two-leggers seem to be reading them, but I have yet to raise any money to help my homeless dog friends. I met Sugar (one of my fostered homeless dog friends from It’s a Dog’s Life) at the vets’ the other day when I was there, and I felt a bit sad saying that my project wasn’t having the impact I’d hoped for. So, I thought maybe I’d try again with the Tail Thumper of the Week column. Especially since Elizabeth has so many really wonderful and helpful books about dogs on the shelves of her bookshop! Today, I thought I’d tell you about a book that Elizabeth says would make a good stocking-stuffer. “But that’s what paws are for!” I said. Just a little book, perfect for a dog-lover’s Christmas stocking! Click on the pic to buy it and my 20% commission goes to It’s a Dog’s Life! This book is great for little hands and small dog-lovers, but it’s also wonderful for two-leggers who already have one dog, might like more but are responsible enough to know that one is probably plenty. Two-leggers like that can never get enough dog content into their lives. What better gift for them? And the best part of all is that this book is not expensive…. You could even get one of my Book Paws to go with it (readers could use one to mark their favourite dog photo) and still have a gift (or two…) for under $10! And you’d make my tail thump even more ’cause you’d also be giving a gift to my homeless dog friends here in Kenora. 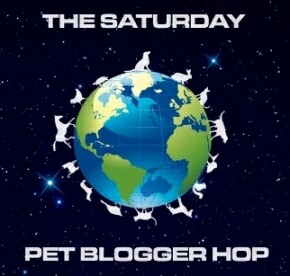 We’re participating in this Saturday’s Pet Blog Hop, hosting by Life With Dogs, Two Little Cavaliers and Confessions of the Plume. If you’d like to participate, please follow the rules and follow your three hosts, add your blog to the Linky and copy and paste the html code into your html editor. Thanks again to our hosts for putting on the hop!